Western clerics, colonialists and credulous academics have been battling for control of the official historical narrative of the Americas since the discovery of the New World by Christopher Columbus. One of the bigger battles is over the appropriate appellation to be collectively applied to the exploited/exterminated/dispossessed/displaced/corralled inhabitants of the New World. Another long running battle involving the clerics, colonialists and credulous academics has revolved around whether the Americans discovered in the New World have any connection to the Ten Lost Tribes of Israel. The ten lost tribes were the ten of the twelve tribes of ancient Israel that were said to have been deported from the Kingdom of Israel after its conquest by the Neo-Assyrian Empire circa 722 BCE. The intrigue starts right at the beginning of the official historical narrative. When Christopher Columbus arrived in Cuba he initially sent ashore his Hebrew/Aramaic/Arabic interpreter because he believed the landing party might encounter “descendants of the Ten Lost Tribes of Israel”. Luis de Torres (died 1493), perhaps born as יוסף בן לוי העברי, Yosef ben Levi Ha-Ivri, (“Joseph, Son of Levi, the Hebrew”) was Christopher Columbus’s interpreter on his first voyage and the first person of Jewish origin to settle in America. While still a Jew, de Torres served as an interpreter to the governor of Murcia due to his knowledge of Hebrew, Aramaic, Arabic, and Portuguese. In order to avoid the expulsion edict against the Jews of Spain, de Torres converted to Catholicism shortly before the departure of Columbus’s expedition. Columbus hoped that the interpreter’s skills would be useful in Asia because they would enable him to communicate with local Jewish traders, and he may also have believed that he would find descendants of the Ten Lost Tribes of Israel. After arriving at Cuba, which he supposed to be the Asian coast, Columbus sent de Torres and the sailor Rodrigo de Jerez for an expedition inland on November 2, 1492. Therefore, it’s arguable that Columbus was covertly searching for the Lost Tribes of Israel whilst overtly insisting [“in the face of mounting evidence to the contrary”] that he sought the “Asian continent, as previously described by Marco Polo”. Christopher Columbus (Italian: Cristoforo Colombo; c. 1451 – 20 May 1506) was an Italian explorer, navigator, colonizer, and citizen of the Republic of Genoa. Under the auspices of the Catholic Monarchs of Spain, he completed four voyages across the Atlantic Ocean. Those voyages and his efforts to establish permanent settlements on the island of Hispaniola initiated the European colonization of the New World. Throughout his life, Columbus also showed a keen interest in the Bible and in Biblical prophecies, often quoting biblical texts in his letters and logs. For example, part of the argument that he submitted to the Spanish Catholic Monarchs when he sought their support for his proposed expedition to reach the Indies by sailing west was based on his reading of the Second Book of Esdras (see 2 Esdras 6:42, which he took to mean that the Earth is made of six parts of land to one of water). Towards the end of his life, he produced a Book of Prophecies in which his career as an explorer is interpreted in the light of Christian eschatology and of apocalypticism. Columbus always insisted, in the face of mounting evidence to the contrary, that the lands that he visited during those voyages were part of the Asian continent, as previously described by Marco Polo and other European travelers. Genoa was one of the so-called “Maritime Republics” (Repubbliche Marinare), along with Venice, Pisa, and Amalfi and trade, shipbuilding and banking helped support one of the largest and most powerful navies in the Mediterranean. Either way, by 1643 the Lost Tribes of Israel storyline was firmly established when Roger Williams noted American affinities with Hebrew and the Jewish culture. First, others (and my selfe) have conceived some of their words to hold affinitie with the Hebrew. Secondly, they constantly annoint their heads as the Jewes did. Thirdly, they give Dowries for their wives, as the Jewes did. Fourthly (and which I have not so observed amongst other Nations as amongst the Jewes, and these) they constantly seperate their Women (during the time of their monthly sicknesse) in a little house alone by themselves foure or five dayes, and hold it an Irreligious thing for either Father or Husband or any Male to come neere them. The storyline was further reinforced in 1650 when Thomas Thorowgood substantially expanded the list of affinities by [amongst many other things] noting an American affinity for circumcision [as originally reported by Columbus]. Along with Columbus‘ ‘discovery’ of North America he noted that many of the natives there were circumcised [Gairdner, 1949]. The advanced civilizations of pre-Columbian America practised circumcision, although the more primitive tribal people did not. Once again, this may reflect the loss of ritual in times of privation. The Spanish conquistadores banned the practice as part of their systematic destruction of the indigenous cultures. It is now rare in South America, though more common in Latin North America. In 1650, a British divine named Thomas Thorowgood, who was a preacher in Norfolk, published a book entitled Jewes in America or Probabilities that the Americans are of that Race, which he had prepared for the New England missionary society. The society was active in trying to convert the Indians but suspected that they might be Jews and realized they better be prepared for an arduous task. Thorowgood’s tract argued that the native population of North America were descendants of the Ten Lost Tribes. The Lost Tribes of Israel storyline was still developing in the 19th century. 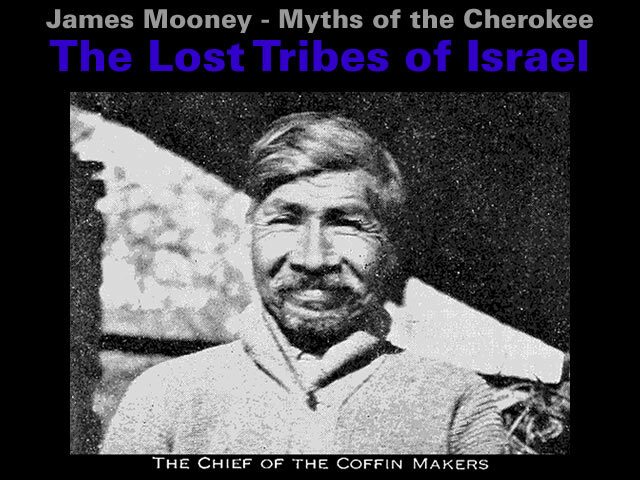 And at the beginning of the 20th century James Mooney noted in the Myths of the Cherokee a migration legend that “simply” echoed the The Exodus narrative associated with Moses. In Buttrick’s Antiquities we find some notice of this migration legend, which, as given by the missionary, is unfortunately so badly mixed up with the Bible story that it is almost impossible to isolate the genuine. He starts them under the leadership of their “greatest prophet,” Wasi – who is simply Moses – in search of a far distant country where they may be safe from their enemies. Who these enemies are, or in what quarter they live, is not stated. Soon after setting out they come to a great water, which Wasi strikes with his staff; the water divides so that they pass through safely, and then rolls back and prevents pursuit by their enemies. They then enter a wilderness and come to a mountain, and we are treated to the Bible story of Sinai and the tables of stone. Here also they receive sacred fire from heaven, which thereafter they carry with them until the house in which it is kept is at last destroyed by a hostile invasion. This portion of the myth seems to be genuine Indian. “the tribes marched separately and also the clans. The clans were distinguished by having leathers of different colors fastened to their ears. They had two great standards, one white and one red. The white standard was under the control of the priests, and used for civil purposes; but the red standard was under the direction of the war priests, for purposes of war and alarm. The Exodus is the founding, or etiological, myth of Israel; its message is that the Israelites were delivered from slavery by Yahweh and therefore belong to him through the Mosaic covenant. Mooney suggests this Cherokee legend is “badly mixed up” with the missionary Bible story. But it’s a lot harder to explain away all the other artefacts, linguistic affinities and DNA evidence that connects North America with the Middle East. But, needless to say, this didn’t stop the mainstream from explaining away “numerous popular fallacies”, “half-knowledge”, “distorted views”, “mass of pseudo-scientific and thoroughly unscientific literature” along with some “absurd and extravagant theories and speculations”. The appellation “Americans” was for a long time used in English to designate, not the European colonists, but the aborigines, and when, in 1891, Dr D. G. Brinton published his notable monograph on the Indians he entitled it The American Race, recalling the early employment of the term. The North American Indians have been the subject of numerous popular fallacies, some of which have gained world-wide currency. Here belongs a mass of pseudo-scientific and thoroughly unscientific literature embodying absurd and extravagant theories and speculations as to the origin of the aborigines and their “civilizations” which derive them (in most extraordinary ways sometimes), in recent or in remote antiquity, from all regions of the Old World Egypt and Carthage, Phoenicia and Canaan, Asia Minor and the Caucasus, Assyria and Babylonia, Persia and India, Central Asia and Siberia, China and Tibet, Korea, Japan, the East Indies, Polynesia, Greece and ancient Celtic Europe and even medieval Ireland and Wales. The theory that the American Indians were the “Lost Ten Tribes of Israel” has not yet entirely disappeared from ethnological literature. Many of the identities and resemblances in ideas, customs and institutions between the American Indians and the ancient Hebrews, half-knowledge or distorted views of which formed the basis of the theory, are discussed, and their real significance pointed out by Colonel Garrick Mallery in his valuable address on “Israelite and Indian: A Parallel in Planes of Culture” (Proc. Amer. Assoc. Adv. Sci. vol. xxxviii., 1889, pp. 287-331). The whole subject has been discussed by Professor H. W. Henshaw in his “Popular Fallacies respecting the Indians” (Amer. Anthrop. vol.vii. n.s., 1905, pp. 104-113). This explaining away is primarily based upon suggesting the storyline is “absurd”. As soon as, or even before, the newly-discovered continent was found to be not connected with Asia, theories of the origin of the Indians began to be formulated by the learned, and, consistently with the religious spirit of the age, a solution of the problem was sought in Hebrew tradition. The latest and most earnest supporters of the Hebrew origin are the Mormons, whose statements are alleged to have the authority of direct revelation. Absurd as the theory is in the light of present knowledge, anthropology owes to it several valuable treatises on the habits and characteristics of the Indians, which it could ill afford to lose, notably Lord Kingsborough’s Mexican Antiquities and Adair’s History of the North American Indians, the latter book being filled with fancied similarities to Jewish customs, rites, and even traditions. Additional explaining away is provided by applying “more discriminating rules” with “a percentage of coincidences” whilst proposing a purely “parallel” development hypothesis. The authors of the school mentioned rest their case on the fact, which I freely admit with greater emphasis, that an astounding number of customs of the North American Indians are the same as those recorded of the ancient Israelites. The lesson to be derived from this parallel is, however, very different from that drawn by those who have advocated the descent in question. The argument, strongly urged, derived from an alleged similarity between Hebrew and some Indian languages, especially in identity of certain vocables, may be dismissed forthwith. Perhaps the most absurd of all the coincidences insisted upon by Adair was the religious use of sounds represented by him to be the same as the word Jehovah. The ” lost ” Israelites when deported did not use orally the name given in the English version as ” Jehovah,” and the mode of its spelling and pronunciation is at this moment in dispute, though generally accepted as Jahveh ; therefore, it would be most extraordinary if the tribes of Indians supposed to be descendants of the lost ten tribes of Israel should at this time know how to pronounce a name which their alleged ancestors practically did not possess. Father Lafiteau was so much excited by coincidence in sound of some of the Iroquoian names and expressions with the language of the ancient inhabitants of Thrace and Lycia that he based thereon a theory of descent. On similar grounds ancestors of the Indians have been found among the Phoenicians, Scandinavians, Welsh, Irish, Carthaginians, Egyptians, Tartars, Hindus, Malays, Chinese, Japanese, and all the islanders of Polynesia. It is not wonderful that, with the choice of three hundred Indian languages, besides their dialects, from which to make selections of sounds, some one should be likened to some other language, for all spoken languages can in that manner – i. e., by a comparison of vocables – show identity of sound and a percentage of coincidences of significance. Philology now applies more discriminating rules of comparison. When all else failed the mainstream “demolished” “all arguments” by asserting the Lost Tribes of Israel [are you ready for this stoke of creative genius?] “were not lost”. But all arguments that the Indians are descended from the ” lost tribes ” are demolished by the fact, now generally accepted, that those tribes were not lost, but that most of their members were deported and absorbed, their traces remaining during centuries, and that others fled to Jerusalem and Egypt. Clearly, the academic arts of waffling and arm waving have improved slightly in the last 100 years. Interesting, I wonder if the indigenous American tribal names translate to anything meaningful in the old Hebrew language? Does ‘Cherokee’, ‘Skarooren’, ‘Shawanwa’, ‘Wampanoag’ , ‘Aniyunwiya’ ‘Hopi’, ‘Siksika’, etc., have any significance? Or is it just Cherokee which has translatable words and structure as it is one of the very few indigenous American languages that has a written script? Creating such maps with any degree of precision is impaired by several profound difficulties. Individual political and lingusitic entities were not “countries” in the current sense of the term, and usually were spread out of great distances while overlapping in territory with others. Sharp borders such as we see on maps today rarely existed. Many populations moved seasonally, as the lifestyle adapted to local climate. Almost all moved permanent homelands from place to place as Europeans moved in, usually to the west, but movement and resettlement also occured frequently before colonization began. According to the map, languages with roots in Algic (e.g. Cree) are the most widespread, Cherokee appears to be a relatively very small isolated island of an Iroquoan language. Of course both languages will have many influences on each other locally, much as in Europe there are so many links between each modern language. It is a fascinating topic, I wish I had time to learn more. I have always been intrigued by the 10 Lost Tribe theory. Being Cherokee and having grown up in Tahlequah, OK, I am a native Cherokee speaker. When I was in the USMC and first stationed in Korea, I thought I heard bad Cherokee being spoken but I could only understand about 1 in 12, or so, words. Take the word for hello. In Cherokee, it is “o si yo”, pronounced “Oh-see-YOH”. A similar welcoming word in Korean is “yeo bo se yo”, pronounced “ya boo see yoh “. Because the languages were so similar, my housekeeper was able to teach me spoken Korean in just a few months. Why are they so similar? Other people are asking the same question.